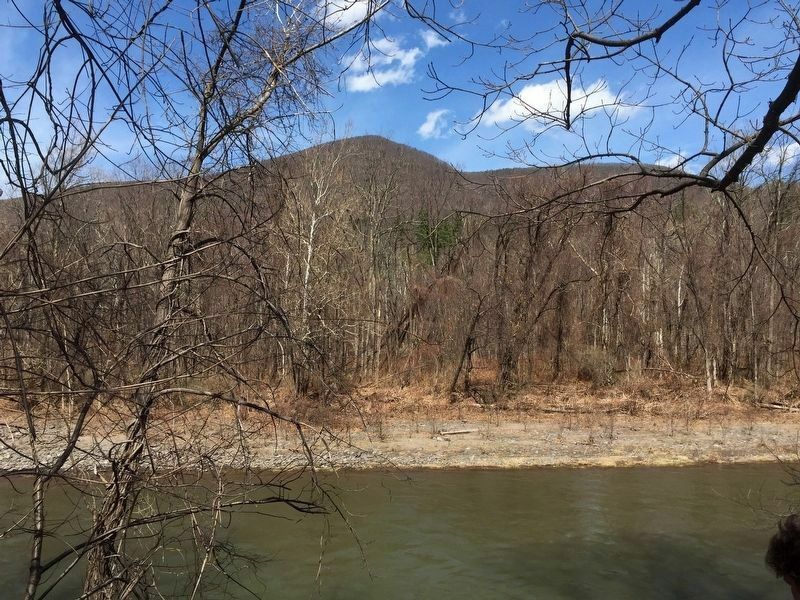 The deep ravines, irregular ridges and rocky slopes of the Catskill Mountains long remained wild and desolate. Small settlements began in the mountain valleys before the American Revolution. After the war, population grew steadily as New Englanders streamed into the the higher areas, which they called the "cold lands." The Ulster and Delaware Turnpike was begun in 1802 to connect Kingston and Walton through mountain passes used by present highways. After 1875, the Ulster and Delaware Railroad, later part of the New York Central system, wound its way from Kingston to Oneonta. Timber and water power made lumbering the principal occupation. Great stands of of hemlock supplied bark for tanning leather. Furniture makers and hoop shavers once labored here. Bluestone quarrymen and glass blowers also used the resources of the area. 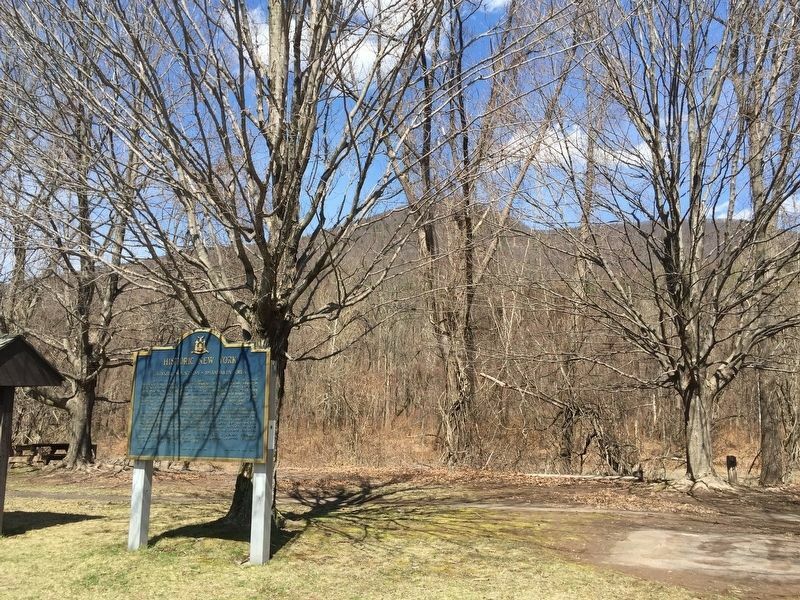 Catskill vistas attracted many artists, and Washington Irving and John Burroughs wrote about the surroundings. The mountains have long been famous as a resort area. In 1904, the State established the Forest Preserve to safeguard forever the natural resources. Schoharie Reservoir with Esopus Creek thus to feed the Asokan Reservoir, a source of water for New York City since 1915. Erected 1965 by State Education Department/New York State/Department of Transportation. Marker series. This marker is included in the Historic New York marker series. Location. 42° 3.174′ N, 74° 17.487′ W. Marker is in Shandaken, New York, in Ulster County. Marker is at the intersection of New York State Route 28 and Mt. Pleasant Road, on the right when traveling west on State Route 28. Touch for map. Marker is in the rest area. 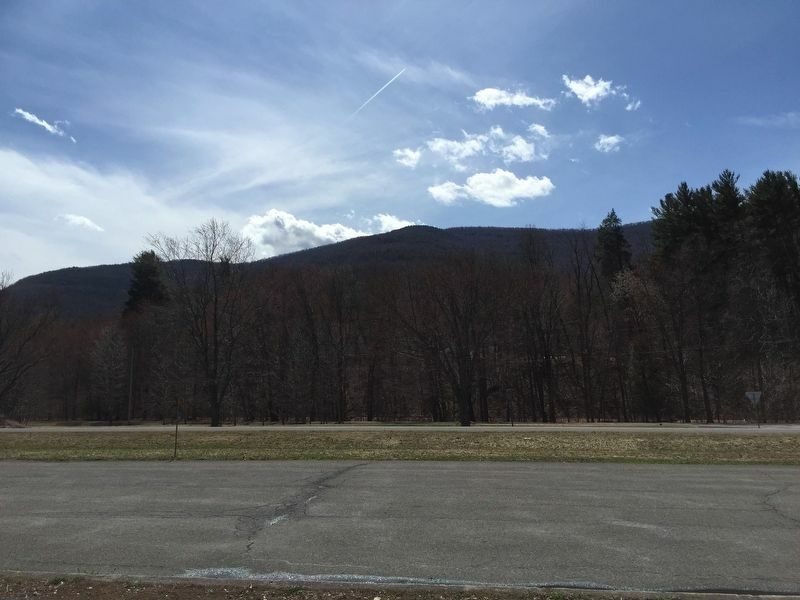 Marker is in this post office area: Shandaken NY 12480, United States of America. Touch for directions. Other nearby markers. At least 8 other markers are within 10 miles of this marker, measured as the crow flies. Fort Shandaken (approx. 1.6 miles away); Mount Tremper Fire Tower (approx. 2.4 miles away); Catskill Water Supply System (approx. 5.7 miles away); Shokan Reformed (approx. 6.6 miles away); Old School Baptist Meeting House (approx. 6.8 miles away); One Hundredth Anniversary (approx. 8.3 miles away); Olivebridge (approx. 9.3 miles away); To Honor (approx. 9.3 miles away). Touch for a list and map of all markers in Shandaken. Looking south across NY 28 from marker. More. 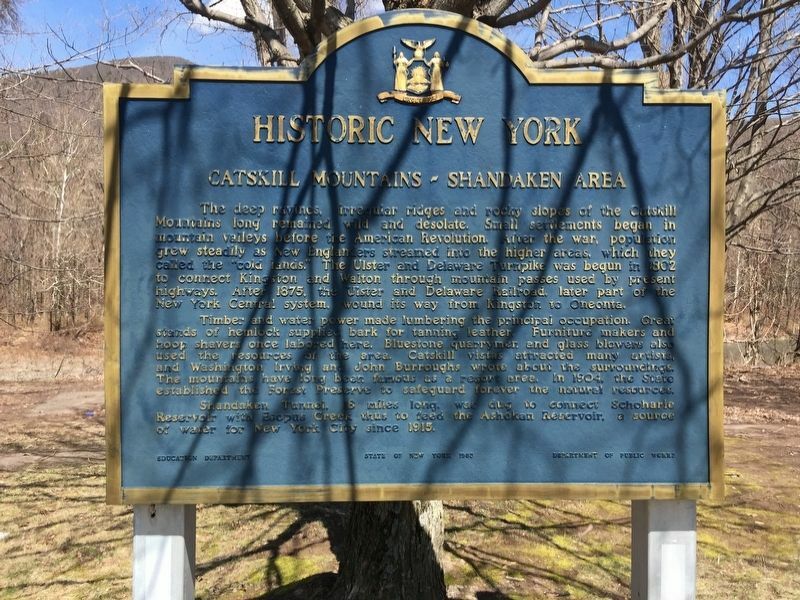 Search the internet for Catskill Mountains - Shandaken Area. Credits. This page was last revised on April 15, 2019. This page originally submitted on April 14, 2019, by Steve Stoessel of Niskayuna, New York. This page has been viewed 44 times since then. Photos: 1. submitted on April 14, 2019, by Steve Stoessel of Niskayuna, New York. 2, 3, 4. submitted on April 15, 2019, by Steve Stoessel of Niskayuna, New York. • Andrew Ruppenstein was the editor who published this page.